“This nameless princess is a fabulously different kind of hero. I rooted for her triumph with every page turn."? —Deborah Halverson, award-winning author, editor?? Gail Carson Levine’s classic Ella Enchanted meets The King’s Speech.?? It's her 14th try at getting a name, and the nameless princess of Cochem can't get a word in edgewise. When she finally grabs her royal parents' attention, (500 goldfish, long story), christening invitations flutter off to the Seven Kingdoms—only ten years late. But then the Blackfly Queen strides into the feasting hall . . . just as the oh-so-tasty parsnip fries run out. Arrows fly. Tempers flare. Another christening goes up in smoke! Only this time, her fairy godmother makes everything worse. The princess has 15 days to make a name for herself at the Speech Tournament. Or she'll be invisible for life! 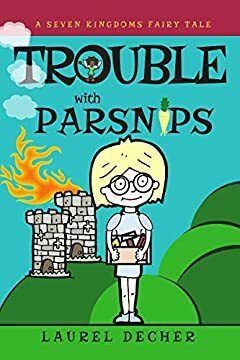 TROUBLE WITH PARSNIPS is the first book in the Seven Kingdoms Fairy Tale series for ages 9 to 12. Perfect for fans of Jean Ferris' Once Upon a Marigold, Jacqueline Davies' The Lemonade Wars, and E.G. Foley's The Gryphon Chronicles. Hungry readers always need books. Keep them well read: order a copy of TROUBLE WITH PARSNIPS today!